Barbara Ardinger teaches us that a contemporary spiritual experience can show up in some of the most unexpected places- such as The Muppet Show and Dirty Dancing. 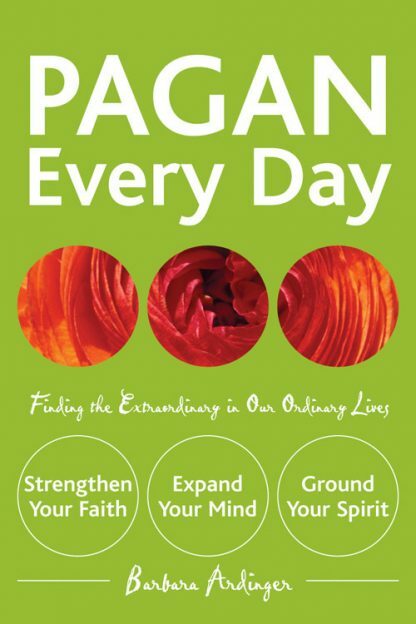 Clearly Pagan Every Day is not your ordinary goddess-a-day or spell recipe book! Rather than writing about the usual sabbat rituals and offering the standard goddess-speak, Ardinger offers 366 (365 plus one to grow on) literate and witty entries on various topics that provoke readers with new ideas and new ways of exploring paganism as a spiritual practice. Included are the holy days of other cultures, pagan elements in literature, lessons from history, famous pagans, and popular culture and paganism. Ardinger teaches us to look for undercurrents of esoterica not only in witch movies or fantasy -television, but in the mainstream culture. Take February 2- reflect on the movie Groundhog Day and how it symbolizes karma and reincarnation. Intertwined are some more traditional pagan beliefs, with a contemporary twist. On August 17, Ardinger retells the familiar story of Odin and his search for runes and transforms it into a shamanic journey for each of us to find our own runes. Jane Goodall, Judy Chicago, John Donne, Miss Piggy, Harry Potter, the Ghosts of all those Christmases, Mary Magdalene, not to mention Saturn, Diana, Sonnenwenda, Adonis, Aphrodite- they all have their places in Pagan Every Day. Pagan Every Day offers good reminders that every day offers something ordinary and luminous at the same time. Barbara Ardinger, Ph.D. is a Witch, teacher, and freelance writer and editor. Her book reviews have appeared in SageWoman, PanGaia, newWitch, Gnosis, and other magazines. She earned her doctorate in English Renaissance Literature and has studied the Tarot, Reiki, numerology, color healing, and the Qabalah. She holds a third degree initiation from a secret occult order, is an initiated Dianic Witch, and has been a member of the Fellowship of Isis since 1978. Ardinger is the author of several books including Goddess Meditations, Practicing the Presence of the Goddess, and A Woman's Book of Rituals and Celebrations. The chambermaid for her 20-year-old cat, she lives in Long Beach, California.